Buddhism is the fastest growing religion in the United States, with adherents estimated in the several millions. But what exactly defines a "Buddhist"? This has been a much-debated question in recent years, particularly in regard to the religion's bifurcation into two camps: the so-called "imported" or ethnic Buddhism of Asian immigrants and the "convert" Buddhism of a mostly middle-class, liberal, intellectual elite. In this timely collection Charles S. Prebish and Kenneth K. Tanaka bring together some of the leading voices in Buddhist studies to examine the debates surrounding contemporary Buddhism's many faces. The contributors investigate newly Americanized Asian traditions such as Tibetan, Zen, Nichiren, Jodo Shinshu, and Theravada Buddhism and the changes they undergo to meet the expectations of a Western culture desperate for spiritual guidance. Race, feminism, homosexuality, psychology, environmentalism, and notions of authority are some of the issues confronting Buddhism for the first time in its three-thousand-year history and are powerfully addressed here. In recent years American Buddhism has been featured as a major story on ABC television news, National Public Radio, and in other national media. A strong new Buddhist journalism is emerging in the United States, and American Buddhism has made its way onto the Internet. The faces of Buddhism in America are diverse, active, and growing, and this book will be a valuable resource for anyone interested in understanding this vital religious movement. 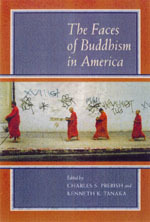 Charles S. Prebish is Associate Professor of Religion at Pennsylvania State University and author and editor of numerous works, including American Buddhism and Buddhist Monastic Discipline. He is currently coeditor of the electronic Journal of Buddhist Ethics. Kenneth K. Tanaka is Professor of Buddhist Studies at the Institute for Buddhist Studies at the Graduate Theological Union in Berkeley and the author of Ocean: An Introduction to Jodo-Shinshu Buddhism in America (1997). He is president of the Buddhist Council of Northern California.